The onward march of progress in consumer electronics is leaving a literal landfill of personal audio devices and iPods in its wake. The onward march of progress in consumer electronics is leaving a literal landfill of personal audio devices and iPods in its wake. Not only do these ubiquitous electronic items contain chemicals that are harmful to the earth when disposed of in an unsafe manner, but they also contain a wealth of rare and non-renewable materials that could be re-purposed instead of being lost forever on a foreign landfill. 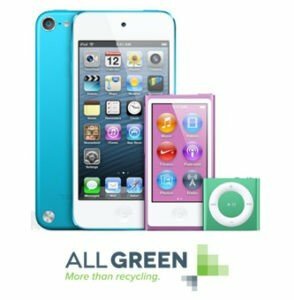 At All Green Electronics Recycling, we can ensure that your consumer electronics, including iPods, are recycled in a responsible way. It is not advisable to depend on a single recycling methodology for recycling all forms of recyclable material – it is wasteful. There are also other safer and more efficient methods, like reusing old materials from iPods and recycling important metals which are becoming scarce. Through years of experience, All Green Electronics Recycling has been able to develop safe routes to take when recycling your iPod’s materials in an environmentally-friendly manner which profits both you and our environment. Travelling around the country picking up enormous amounts of garbage is normally a costly affair, but we have organized an army of electronic disposal trucks in North America to handle this gigantic task. You can call us at any time and we will simply send one of our members to your doorstep to take care of all your burdens related to disposing your items. You can also check online to identify where your iPod is at any point of time. All you have to do is simply pick up the phone and call us. Recycling electronics which may contain personal user data is a task which must be performed with maximum security and care. Our team of highly qualified professionals, who possess certifications like ISO 14001 and R2 Responsible Recycling, handle such a task with the utmost care, and make sure that all data is thoroughly destroyed. The entire process can be tracked by the user at any point of time. Laws around our country regarding the correct disposal of equipment mean financial risk to the unwary who perform inefficient recycling of electronics like iPods. Such issues can be avoided completely by simply placing your faith in us and in turn, we will make sure that all guidelines are followed strictly, and that equipment is disposed of in an environmentally-friendly manner. It’s what we do best! Each year, the US generates 217 million tons of trash. Only 35% of this is recycled. Some of the trash includes electronic devices like iPods. These devices contain valuable metals, recyclable plastics, and in some cases, toxic materials. Lithium-ion batteries, electronic processing chemicals, and heavy metals like lead and cadmium pose a risk to the environment. All Green Electronics Recycling is a responsible electronics recycling company. We believe that environmental quality and fiscal responsibility go hand in hand. Our state of the art deconstruction process removes both toxic and valuable materials from electronics like iPods. Instead of wasting these materials in a landfill, we want to return them to the production cycle in an ethical manner. Recycling also reduces the need for more harmful ore mining and processing activities which can cause grave harm to the environment. There are many ways to re-purpose or unload your iPod. We offer a specialized service that reduces your involvement and increases the ease with which you can properly dispose of you iPod. We’ve found that our clients prefer options, and that’s why we have 2 easy ways to responsibly dispose of your iPod. First, you can drop the device off at one of our many nationwide locations. Conveniently located, our drop off centers are easy to find and quick to use. Second, we can pick up your iPod. At no charge, we’ll come to your location to pick up your electronics and iPods, saving you the maximum amount of time and money. Data integrity is a major concern today, and you don’t have to worry about remaining data on your device. We use the latest techniques to scorch the data from your iPod before any part is re-used. Our ethical standards and reputation demand that we are thorough and diligent about protecting our customers’ data. If the iPod is repairable or contains re-usable parts, we’ll salvage those materials for re-purposing. This helps eliminate electronics processing costs and environmental impact. Once we have your used or broken iPod in our process, you can track the device through the system. This helps ensure that not only are we responsibly disposing of any toxic waste, but you can rest assured that your device has had all data erased and cleaned. We’ve found that providing this feedback brings our clients closer to the recycling process, and helps foster a sense of participation in environmentally responsible activities. With the world’s limited resources and an increasing population, it’s time to get involved in recycling ethically. 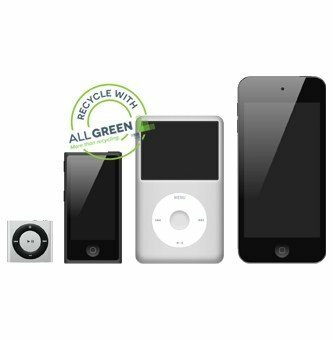 Allow All Green Electronics Recycling to recycle your iPod. We’ll make it fast, easy, and most of all, safe for you and the environment.